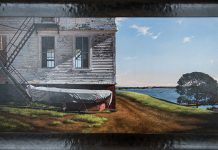 West Tisbury’s Granary Gallery is ending its summer season with a grand slam show that includes Alfred Eisenstaedt, Thomas Hart Benton, Diana van Nes, Andrew Wyeth, and a group of turn-of-the-century American impressionist masters. The show, which opened Sunday, Aug. 26, continues through September 8. Mr. Eisenstaedt died in 1995. The late Life Magazine photographer, who summered on the Vineyard for more than 50 years, is best known for his “V-J Day in Times Square,” the image of a sailor kissing a female bystander at a victory parade, but he often photographed the Island as well. His friendship with the late Mr. Benton led to many photographs of that painter and his family, who also summered on-Island. Ms. van Nes, who died last year, is known for her American flag series, which deconstructs the symbol into what she has called a compendium of American culture. The gallery is also exhibiting a work by Mr. Wyeth, “Big Red,” of an apple tree bearing fruit. The surprise bonus of the show, however, is the gallery’s new collection of American impressionist and Ashcan School painters. American impressionism took its cue from the French, with ambitious young American painters heading to France to study with French impressionists like Claude Renoir. Working with looser brushstrokes, a plein-air (outdoors), approach, and themes taken from everyday life, the impressionists both in France and then in the U.S. rejected the rules and salons of the academy. Mr. Morse calls “Lady in a Flower Garden” by Childe Hassam, who helped introduce impressionism to the U.S., the gem of the collection. The unusually well documented work displays on its reverse side a series of eight transit labels from the Boston Museum of Fine Arts and the Pasadena Gallery of Modern Art, which track its path through the art world. 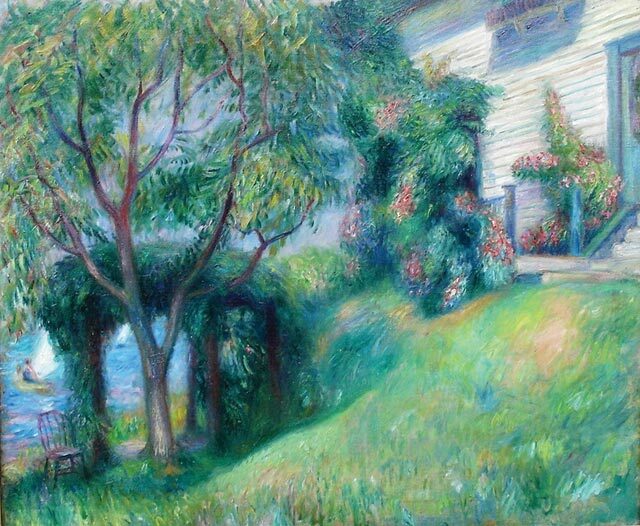 William Glackens, who has two paintings on display at the show, was a founder of the Ashcan School, which moved American artists toward realism and a focus on the depiction of urban life. He was sometimes called the American Renoir, and like many of his colleagues, he supported himself by doing magazine or newspaper illustrations. He is also responsible for selecting the core paintings in Philadelphia’s Barnes Foundation collection. 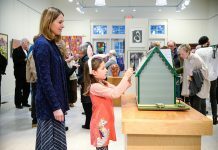 On exhibit are “Jonquils and Winter Roses,” a multicolored floral bouquet, and “House on Eastern Point,” a lush summer landscape with arbor, tree, and flowers framed on one side by a clapboard house. 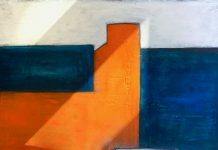 “American Treasures,” August 26 through September 8, Granary Gallery, West Tisbury. For information, call 508-693-0455 or visit granarygallery.com.